Your energy audit should have provided you with specific energy conservation measures you can implement to cost-effectively save energy and reduce your utility bills. This section of the Building Owner’s Toolkit will give you specific information about various energy conservation measures that your audit may or may not have identified. The information in this section has been developed by technical experts, and is provided to give you a broad overview of different technologies and systems that you can install to improve the energy performance of your facility. Each section includes information on who to reach out to for more information. The most energy-efficient type of lighting, LEDs (light-emitting diodes, also referred to as solid-state lighting) offer quality light at a fraction of the energy use of typical lamps. These bulbs will last for an extremely long time (more than 20 years in some instances), which reduces maintenance costs. They are dimmable and can reach full brightness instantly. The lifecycle cost of LEDs is much lower than incandescent lamps. Fluorescent lighting takes two primary forms – compact fluorescent lamps and linear fluorescent tubes – both of which are more energy-efficient than incandescent bulbs. Newer fluorescent lighting systems are more efficient than older types (T5 and T8 lamps are more efficient than T12 lamps, and electronic ballasts are more efficient than electromagnetic ballasts). While the up-front cost of fluorescent bulbs is lower than LEDs, their life expectancy is also shorter, so you’ll end up replacing them more frequently. Primarily used for lighting stadiums, gymnasiums, parking garages, auditoriums, high bays and outdoor spaces, high-intensity discharge lamps are best used when you need to efficiently light a large area. They are also frequently used in retail applications. Perhaps the easiest way to reduce your energy bills is to dim or turn off the lights when they are not needed. Occupancy sensors can determine when tenants are using a space and can ensure that lights are off when offices, conference rooms, and other tenant spaces are not in use. Many current technologies enable the use of advanced control strategies, such as auto-on to 50%. In addition, daylighting controls provide the ability to dim or switch lighting when daylight levels become adequate, such as midday and afternoons. This is often when demand is highest as well. When thinking about your building’s lighting system, it’s important to think in terms of lumens, not watts. Lumens are a measure of light output, whereas watts are a measurement of energy use. A 60-watt incandescent light bulb will put out the same amount of light as a 10-watt LED bulb (approximately 800 lumens), yet the LED will use less than 20% of the power of the incandescent bulb. It’s also important to keep in mind the color temperature of the light, that is, whether the light appears warm and yellow (3000K and below) or cool and blue (5000K and above). Higher temperatures more closely resemble sunlight in the middle of the day, while lower temperatures reflect candlelight. Improving your building’s lighting system by installing energy-efficient LEDs and fluorescents, and by using lighting more intelligently by utilizing lighting controls and daylight management systems, you can save between 30-60% on lighting energy (or operating) costs. That works out to approximately 12-24% of your entire building’s electricity use. Motors use approximately 40% of the electricity in a building, the same amount of electricity it takes to light a building, yet lighting is usually the first system upgraded because it’s there in plain sight. Motor-driven systems are unseen and typically the last to be upgraded; often not until they fail. The life cycle cost evaluation of motor-driven systems commonly confirms payback opportunities of less than two years. Over the life of a motor, the up-front equipment cost is just 2%, while the cost to run the motor is 97% of the total cost of ownership. Electric motors used in commercial buildings are often repaired rather than being replaced when they fail. Motor repairs typically fall into two categories. The most common repair is mechanical in nature. It is estimated that over 65% of motors fail as a result of contamination or oxidation of the grease providing lubrication to the bearings. If the motor has not suffered stator damage as a result of the bearing failure it is most often a sound practice to replace the bearing(s) and re-install the motor. The second type of failure involves the motor’s stator windings. If the repair includes rewinding the motor and evaluation should be made to determine if the repair cost meets minimum life cycle cost goals. Many times motors under 200 horse power can be replaced with NEMA Premium units that use less energy over their lifetime. Building operators and maintenance staff should make an effort to ask contractors and motor suppliers to include new technologies in their retrofit and new equipment options. The motors and controls available today are significantly improved from only a few years ago, offering improved control of system speeds and flow that can dramatically reduce power requirements. Space conditioning (heating and cooling) accounts for roughly 15% of electricity used in commercial buildings – second only to lighting. ENERGY STAR-qualified commercial heating, ventilation, and air-conditioning (HVAC) equipment is designed to reduce energy waste and save money on utility bills. ENERGY STAR-qualified equipment can use 7-10% less energy than standard equipment. According to ENERGY STAR, approximately 25% of all rooftop HVAC units are unnecessarily oversized, resulting in increased energy costs and equipment wear. Properly sized equipment dramatically cuts energy costs, increases the life of the equipment, and reduces pollution. ENERGY STAR-qualified commercial HVAC products can save your business approximately $1.70 per square foot over the life of the equipment. For example, a 12,000 square foot building using ENERGY STAR qualified HVAC products could save more than $21,000 over its lifetime and avoid more than 40,000 pounds of greenhouse gas emissions. Programming your thermostat to adjust the temperature based on occupancy at a given time of day or year can significantly reduce energy waste in your facility. Thermostats for commercial buildings can also integrate into building energy management systems to give building operators full control of your building’s HVAC system and can help you optimize the energy performance of your building and maximize occupant comfort. Variable frequency drives (sometimes referred to as variable speed drives) control the speed of a motor by moderating the incoming frequency of the electricity supplied to a motor. This can significantly reduce energy consumption by running a motor at the appropriate speed to meet airflow needs instead of running the motor at its maximum speed and controlling airflow with dampers. The latter is a very inefficient way to control a motor, akin to driving a car with the accelerator all the way down and controlling the vehicle’s speed using only the brake. An economizer uses outside air or a cooling tower to cool indoor air, using less energy than a traditional air-conditioning system would. Typically, economizers work best in cooler climates. For more information on economizers, read this fact sheet from ENERGY STAR. Heat pumps can either heat or cool a building by extracting heat from the air (i.e., air-source heat pump) or the ground (i.e., geothermal or ground-source heat pump) and releasing it into the air or into the ground where it is not needed. For example, in warmer months, a heat pump can extract indoor heat, cooling your buildings, and releasing that heat into the ground or outside air. In the winter, heat can be extracted from the ground (where temperatures are relatively constant year-round) or outside air and deposit it into your building, warming the inside air. Heat pumps typically work best in more temperate climates. For more information on heat pumps, read this fact sheet from Oak Ridge National Laboratory. The building envelope determines to a large extent how energy efficient the building is. A poor building envelope design cannot be fixed by the HVAC or lighting equipment. The function of the building envelope is multifold. It insulates the building from the elements, it provides occupants views to the outside, and it allows daylight to enter the building to take advantage of the energy and human benefits of daylight. Changes to the building envelope in existing buildings are typically expensive. Properly designed interior shading systems are the most cost effective way to improve both energy performance and human comfort in existing buildings. For new buildings, and when renovations are extensive enough to involve the building envelope, several options exist that provide superior performance in energy efficiency and human comfort. Electrochromic glass is becoming commercially available for building exteriors. It offers a wide range of control of its visual transmittance as well as solar heat gain, making the building highly energy efficient and providing reasonable glare control to occupants. Buildings with electrochromic glass especially on the East, South and West facing orientations may be able to reduce the size of their HVAC equipment. Exterior shading systems have been used in buildings for several decades, especially in Germany. They are effective in blocking solar heat gain from entering the building. The down side is that they may interfere with the view from the inside. However, they are not suitable for all climate zones, such as those that have severe storms. Interior shading systems are the most economical solution for providing thermal and visual comfort to occupants near the perimeter of a building. They should be motorized and automated, otherwise they tend to get pulled the first time the occupants experience sun glare – and never opened again. Automated shades offer some energy efficiency gains, although not as much as controllable glass or exterior shades. They also provide benefits that the other two do not: privacy to occupants, thermal comfort by shielding the occupant from the hot or cold glass, additional thermal insulation, and an aesthetic look to the interior. The potential for energy savings range from about 10% using interior shades to about 20% using controllable glass or exterior shading systems compared to buildings that use standard glazing solutions and no interior shades. These loads can be easily controlled without adverse consequences to most users. Typically consisting of discretionary use devices, such as small heaters and fans, speakers, personal charging stations and other similar devices, these loads lend themselves to a variety of control strategies to reduce the amount of time they are running while not actually being used. Uncontrollable plug loads include load types where automatic shutoff might be harmful to the device or the user. Typical examples will be desktop computers, computer servers, and emergency standby equipment that must remain on at all times. You can meet these requirements without rewiring your building by installing a wireless network (e.g., ZigBee) connecting a 24/7 on-off scheduler plus remotely controllable receptacles, switches and occupancy sensors. Smart strip outlets with built-in occupancy sensors can help reduce your energy consumption, but do not meet the building code requirements for new buildings and significant renovations. To also get electricity cost reductions per kilowatt-hour, many utility companies offer Demand Response programs that typically require some industry standard communication protocol, such as ZigBee Smart Energy, within load controllers. For new buildings, however, it may not only make sense to wire specific receptacles separately from others to manage plug-loads, it may be mandated by the local building energy code. In these types of projects, half the receptacles in a specific space would be wired separately from the other half, either by split wiring individual outlets or clustering controllable outlets together in a space. Then, the controlled outlets can be automatically shut off with an occupancy-based signal or a timer. By unplugging an appliance, you have turned it off completely, eliminating any phantom power draw. Unplugging also helps prevent fires ignited by overloaded appliance wires or components or bad wire junction in the branch circuit. Some newer appliances have reduced phantom power draw and higher efficiency ratings than old appliances. Payback depends on improved efficiency, price of electricity and price of the new appliance, but some appliance replacements will pay back in less than 2 years. Perhaps the easiest way to reduce your energy bills is to automatically disconnect power from appliances when they are not is use. 24/7 control schedules can shut off receptacle during off hours and on weekends. Occupancy sensors can over-ride these schedules for occasional extended usage hours. Payback depends on the price of electricity, number of “off” hours, and size of load, but some automated plug-load control can pay back in months. The U.S. Department of Energy (DOE) estimates that the energy consumption of a data center can be as much as 100 times greater than a standard office building. Because almost all organizations rely on information technology equipment (ITE), most office buildings have one or more data centers. 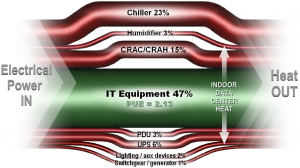 More energy is typically provided to the support equipment (e.g., chiller, humidifier, air-conditioning, and power supply) than to the IT equipment itself, as shown in this figure. Pre-configured, scalable modules or performance-optimized datacenters (PODs). Use economizer mode (“free cooling”) when outdoor air temperature and quality are suitable. Software to manage everything in a data center requires a holistic approach, because all elements of the data center (power, cooling, lighting, IT equipment, etc.) are interconnected. A change in one element can cause a change in another element. Intelligent management prevents “fighting” between different equipment. DCIM should integrate easily with a building information management system. 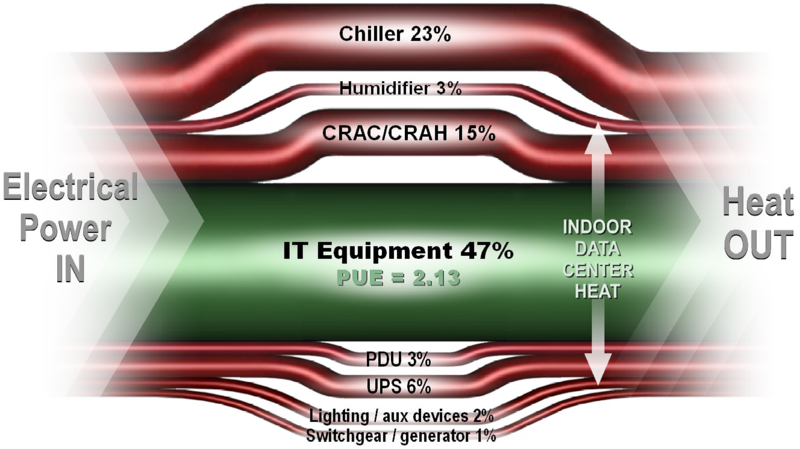 The common metric for defining data center efficiency, developed by the Green Grid, is Power Utilization Efficiency (PUE). While very effective for tracking trends in a data center, PUE is not easily used for comparison with similar data centers. The method of calculation must be identified. Discontinue use of “stranded capacity” (i.e., decommission or consolidate servers and other devices that are under-utilized). In the United States, standard outlets supply power at 120 volts. All Level 1 charging is done at this voltage. Depending on the car and the level of charge on the battery, Level 1 charging can take up to 16 hours to fully charge a battery. New electric vehicles come equipped with Level 1 equipment, which looks similar to an extension cord. Level 2 charging uses 208 or 240 volts and is able to fully charge a battery in 4-6 hours or less, depending on the car and level of battery charge. This is the preferred EV charging method for both public and private facilities. These units are fastened in place and are not intended to be portable. Most Level 1 and Level 2 units use a connector that conforms to the SAE J1772 standard. This enables vehicles from different manufacturers to connect to all standard EV charging stations. Level 3, DC Fast Charge equipment can provide 80% of a full charge in fewer than 30 minutes; it is the EV equivalent of a commercial gas station. The exact voltage and amperage requirements have not been standardized. They are typically 3-phase 480 volt. There is no standard connector yet for the Level 3, DC Fast Charge and most current vehicles have no provision for this type of charging.